First download your theme package from your ThemeFarmer Account. WordPress Dashboard: download your theme and sign into your WordPress dashboard (e.g., yourdomain.com/wp-admin). Navigate to Appearance → Themes → Add New → Upload → Choose File , and select your zipped theme folder, click “Install Now”. Once the theme is uploaded you will need to activate it. FTP upload: download and un-zip your theme folder, and using the FTP program (Ex. FileZila) of your choice upload the theme folder to the ‘../wp-content/themes/’ folder on your server. After that Activate theme into WordPress site Admin Dashboard → Appearance → themes. Amazica use ThemeFarmer Companion plugin Install and activate to use slider, services etc. Create Home and Blog pages. 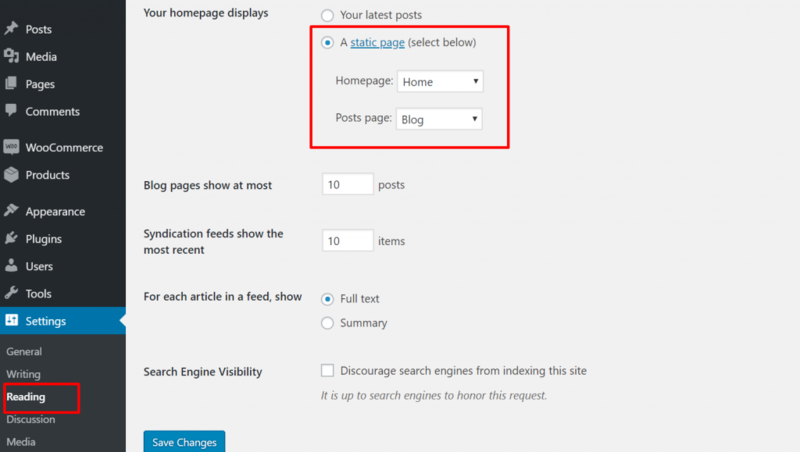 Set Frontpage Display to A static Page select Home form Homepage and Blog for Post Page. Logo: recommended image dimensions are 500×100. Site Title: your site title. Tagline: A tagline is short phrase, or sentence, used to convey the essence of the site and is often funny or eye-catching. it will appear below your site title. Site Icon: a icon that will appear on browser window’s title bar with title.